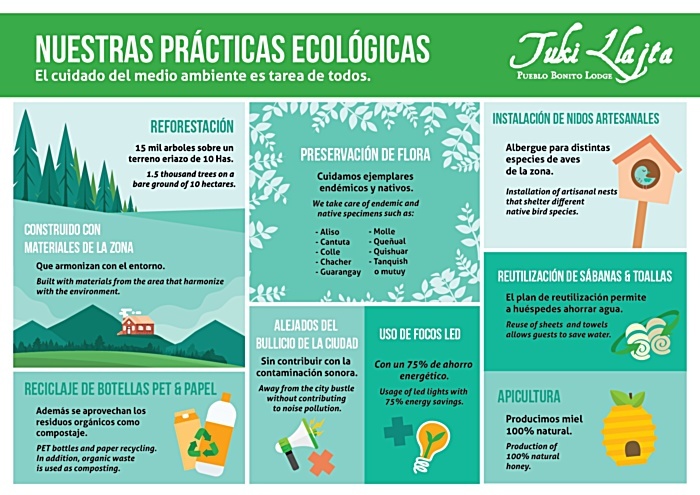 One of the objectives of Tuki Llajta Lodge, is to achieve the well-being of the environment, by which every day we try to adapt our facilities and services to the environment. The first important step that we took was the reforestation of the hill where the lodge is located which has generated that many animals take this place as their home. In this way, Tuki Llajta Lodge wants to become an institution that promotes the good ecological practices through sustainable tourism. Tuki Llajta is built with local materials that harmonizes with the environment where it is located. Tuki Llajta recycles bottles PET and the paper used. Likewise, has been designing a recipe appropriate composting using organic restaurant waste. We have an operational management of workers of the area. In our gardens we have properly identified native and endemic species. 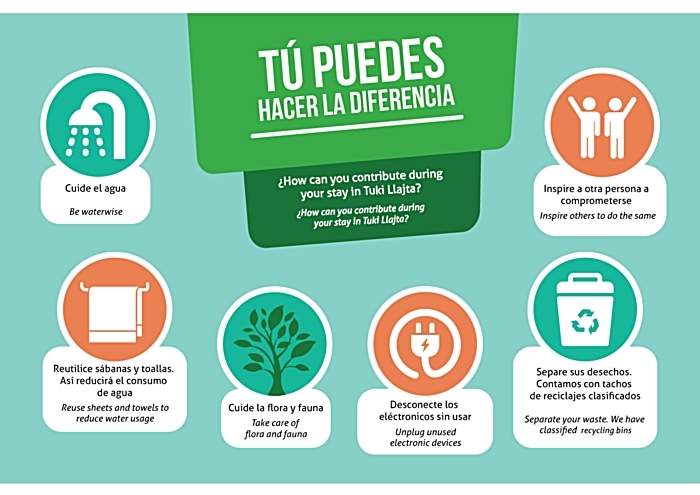 Tuki Llajta is gradually changing saving bulbs by LED lights. We are located at the top of a hill, away from the hustle and bustle of the city and thus we provide the visitors tranquility and breathtaking scenery. We have installed craft nests as shelter for different species of birds that are developed in the area. Beekeeping: we have 4 beehives which produce honey 100 natural. Reforestation of 15,000 trees on an eriazo plot of 10 hectare. The main specimens of flora that can be found in the lodge, are: colles, quinual, quishuar, Cypress, eucalyptus and pine trees. We implemented a plan of reuse of linens and towels supplied to our guests.